I posted photos of these on Facebook a few weeks ago and just realized I did not update my blog with the story behind them! 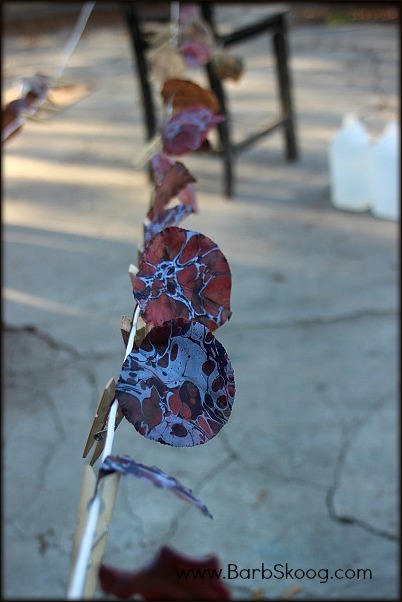 If you can't tell, these are marbled leaves. Yes, marbled leaves. And they are stunning. I'm not a big fan of removing things from nature. Be in it, experience it, enjoy it ~ but leave as small a footprint as possible. I don't collect rocks from riverbanks (which often are homes to creatures underneath) or wildflowers from mountain sides (how can more flowers bloom the next year without a seed source?). I didn't even collect sand from Ninety-mile Beach in New Zealand when I was there a few years ago (if everyone took sand, it would become Nine-mile Beach). But I found these leaves under some beautiful trees that lined a public open space in Old Town Pasadena. Based on the scant number of leaves on the concrete ground surrounding them, it was obvious that every day someone comes by and cleans them up. Figuring the leaves likely end up in a landfill somewhere rather than being composted (where the nutrients could be returned to the soil from which it came), I squatted down and started picking them up. I had no intention, initially, to marble them. I was simply drawn to their beautiful colors and was going to scatter them on my dinning room table until they dried up ~ at which point I'd then put them in *my* compost pile. It just so happened I had my small tank up and when I got home with the leaves, the idea to marble on them was born. I had no idea how it was going to turn out. Would the alum eat through the leaves? Did they need to be alummed at all (the answer to that is yes)? Would the paint even show up? Would the leaves just fold or curl up making it impossible to work on? Clearly, the experiment worked. 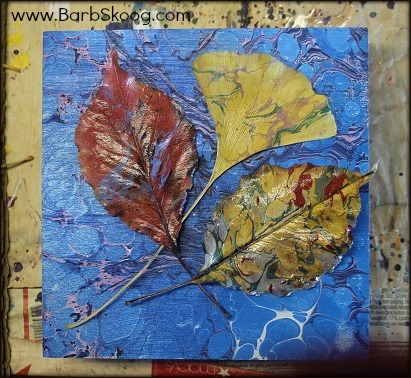 I loved the leaves so much that I decided to spray them with a gloss finish in order to preserve them ~ the added bonus being that the colors really POPPED when I did. So the other day when I was on my walk around my neighborhood I came across a ginkgo tree that was still dropping leaves. I scooped up the ones that were in the street and rushed home to make bath. I was excited to marbled on them. 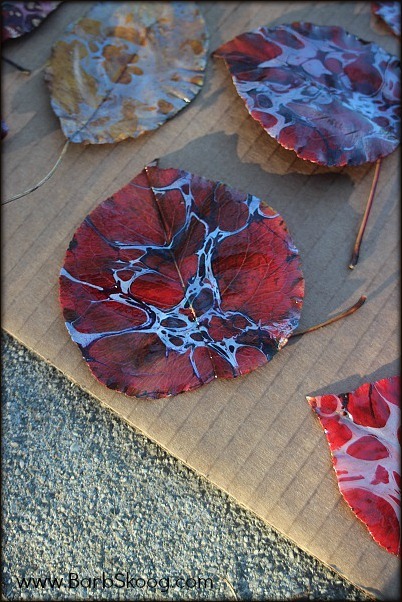 Alas, as with paper or wood or fabric, all leaves are not created equal and these were MUCH more difficult to marble on. Even with alum, the paint just did not want to stay on. And some paints worked better than others. 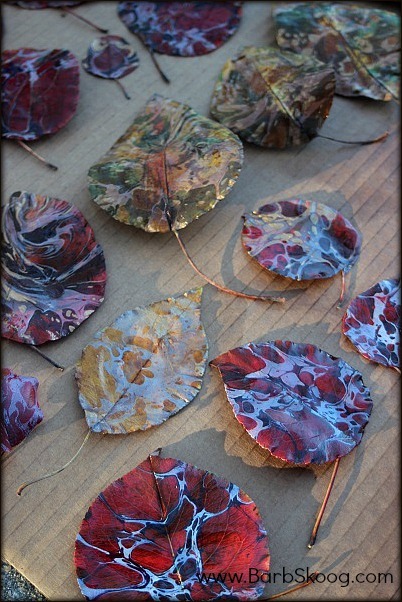 So I am less than thrilled with this batch of marbled leaves, but I got another handful last night and will marble on them today, tweaking my bath, paints, and process along the way. 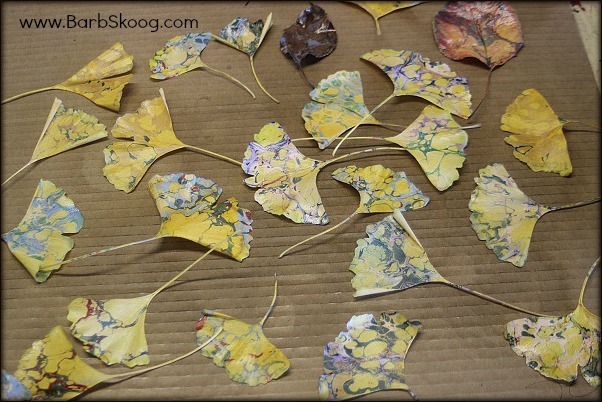 Despite not being easy to marble on, I really like the *shape* of the ginkgo leaf...and when I grouped it with other leaves and put them on a marbled wood panel, I liked what I saw.